This one’s for the bloggers, and any one else who’s thinking of being one. Also: Yes this IS a fiasco. Also: I’m pretty sure the Dayre servers haven’t encountered such a load before. 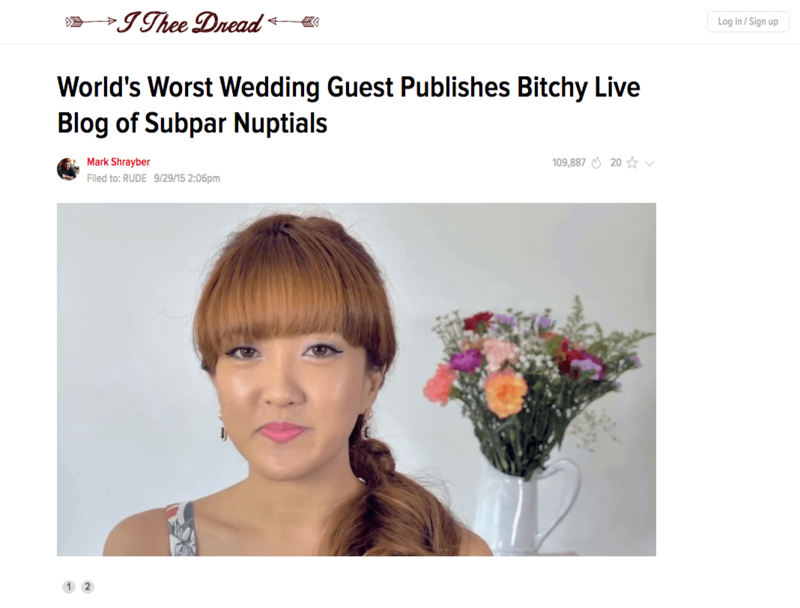 Many of you may have heard about how beauty blogger Juli Bun Bun decided to live-blog a wedding she was attending on Dayre. This didn’t go down well. She said a bunch of things that weren’t very nice because she thought the bride and groom would never see her post, and promptly got slammed online for the words she wrote. Her scathing words got screen-capped and ended going global. A blogger from Singapore has ended up on international sites, and the headlines aren’t pretty. Here’s another fact: Say what you will about the lack of journalistic ability/integrity that plague sites like Elite Daily, Jezebel or the Daily Mail. These sites draw huge traffic, comprised of a global audience. Millions of pageviews on a monthly basis and even more when there’s viral content. Many people have been asking about how she’s benefitted from this attention or whether she’s remorseful about her actions. Is this really how we want the world to see Bloggers? Set aside the whole “Oh I’d never do that to my friend’s wedding” because this isn’t about just you – This one’s about all of us. Like it or not, the truth is if we really want to be (God I hate this word) “Influencers”, then we have to recognise that we actually influence people. This is not a title, it isn’t a name you just throw around to make some money with. This is a responsibility. We’re responsible for the people that read the site because we affect them, in big and small ways. Words can break people or lift them up. With the sheer number of people reading blogs these days, that has to count for something. With great traffic, comes great responsibility. Doesn’t matter if you’re a lifestyle, beauty, food or rojak blogger (like me). You’re responsible for the words you put out, to the people that read your material. Your words matter, use them wisely, for the good of others and yourself. After all, silence can sometimes be pretty golden. Agreed. Words are powerful. They can help or kill you, depends on how you use it. – Chapalang blogger. Sad to say, this happens on a regular basis. It decides what path we take tomorrow as well. Great points there Kenneth, and I can’t agree more. While stirring sh*t and igniting controversies could be one way to generate traffic (I am sure hers must have spiked up after this incident), the negative publicity is definitely not worth it. Maybe bloggers can get together to do something good instead, like what the food bloggers did for hawkers and local cuisine. That will help to cast a positive light on us. BTW, good work with your blog! I agree that traffic generation can be collaborative in nature, and does not require us to tear anyone down. Food bloggers are a great example, and bloggers can and should have collaborative discussions on their own blogs about social issues. Bloggers do have the ability to influence society positively. As a collective, we carry weight. However, what we do with that weight depends solely on us.